So this is a different new giant Argentinian titanosaur from the one that David Attenborough as talking about? Man, we sure live in a golden age of new giant Argentinian titanosaurs. Actually, I rather like the Noto– prefix (meaning Southern) as in Notoceratops and indeed Giganotosaurus. It also crops up, in a different form, in the plant genus Nothofagus, the so-called “southern beeches”. Notocolossus is definitely a much more evocative name for one of the largest things ever to walk the earth than is Argentinosaurus. Great post, Matt — and thanks for your kind words on the paper! Marvelous ! I knew the aeolosaurus. Now, it has a brother ! Many thanks ! 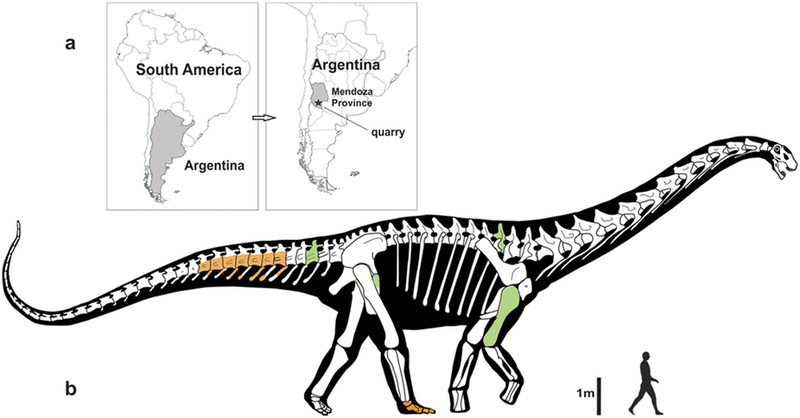 As the author said, there were other sauropods from Argentina and elsewhere there that were bigger. So Notocolossus was not a colossus – I’m sorry, I just HAD to say that. Am I the only one wondering why the skeletal has 13 cervicals? None of its sister taxa, or other relatives have 13 cervicals. The only titanosaur that has a completely preserved cervical column is Futalognkosaurus and it has only 10-11 cervicals. Dreadnoughtus doesn’t have a compete enough cervical column to bracket from. Its other closest relative Tapuiasaurus doesn’t have enough cervicals to support the idea of Lithostrotians having ~13 cervicals. Not that I’m calling Gonzales et al. liars, nor am I criticizing their expertise. I’m just wondering where they got that number from. We are displaying the reconstruction of Daxiatitan binglingi, but not Huanghetitan ruyangensis. The total body lengths of Daxiatitan and Huanghetitan are estimated to be 30 and 18 metres respectively. About 270 pieces of fossils, including sacral vertebrae, dorsal vertebrae, ribs, femur and tibia of Ruyangosaurus giganteus were unearthed since 2006. One of the vertebrae is huge and measures up to 68 centimetres in diameter. This is the thickest vertebral ever discovered in the world so far. We are displaying this vertebra and another 13 real fossils of vertebrae and a replica of femur of Ruyangosaurus. Thanks, everyone, for the comments. Matt and Bernardo, I’m glad you liked the post. I liked your paper – congratulations! (1) A centrum 68 cm in diameter would be more than 10% larger than the centra of Puertasaurus and Argentinosaurus. But the other elements of Ruyangosaurus measured by Lu et al. (2009) suggest an animal somewhat smaller than either. For example, Lu et al. estimated that the complete femur was 200 cm, compared to 250 cm for Argentinosaurus. (2) That measurement is not mentioned by Lu et al. 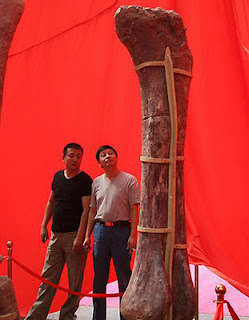 (2009), which is odd, since – as SO Chu Wing notes – it would be the largest vertebra by diameter of any animal, ever. Unless this is from another find, or from material prepared after the publication of Lu et al. (2009)? (3) The wording is strange – “up to” 68 cm in diameter – which makes me think that possibly the measurement was not taken across either of the articular surfaces, or that it is an estimate from incomplete material, or that it was taken from a distorted vertebra whose dimensions were exaggerated by crushing. This does happen – Curtice et al. (1996) reported that the anterior centrum height for BYU 9044, a dorsal of Supersaurus, is 50 cm as preserved, but the vertebra is clearly distorted and they estimated that the actual diameter in life was more like 36 cm. On the other hand, presumably SO Chu Wing is reporting accurately, It’s just hard to square the reported dimension with everything else we know about Ruyangosaurus. I’d like to get in touch with Wing and see if we can get more information and possible a photo. If you have an email address you’d be willing to share, please drop me a note at mathew.wedel@gmail.com. A little more info, after reading around a bit. From what I can gather from the website, the Hong Kong Science Museum seems to be a purely educational institution, without collections or a collections-oriented curatorial staff. The current staff chart (here) does not list a SO Chu Wing, so I’m guessing that person either is no longer employed at the museum, or is actually a curator at another museum commenting on the traveling exhibition. I intend no disrespect to SO Chu Wing, it just seems like their connection to the actual fossils might be a bit tenuous (and as always, please do set me straight if I’m mistaken). 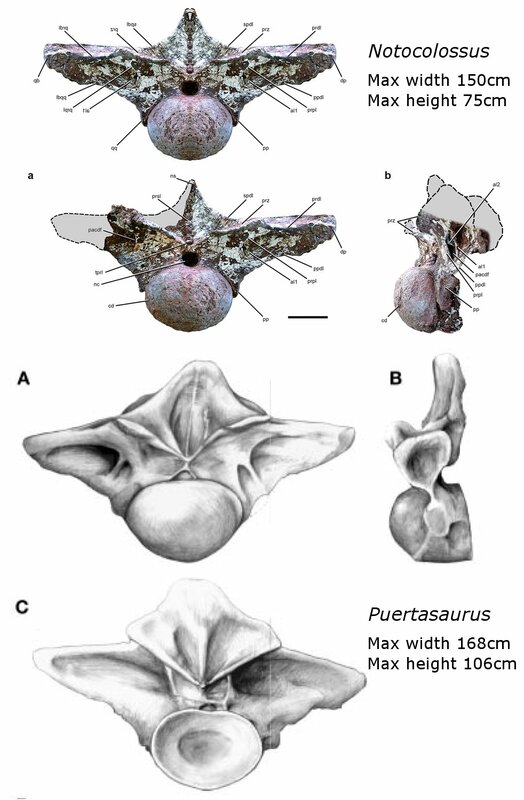 The more I think about it, the more I suspect that the “up to 68 cm” refers to the possible dimensions of an incomplete vertebra – like the big cervical illustrated by Lu et al. (2009), the cotyle of which is only about half complete. That would essentially explain everything. FWIW, Lu et al. (2009) give a centrum width of 51 cm for that vertebra, and although they do not provide measurements for the complete dorsal vertebra, from the scaled photo it also seems to have a max diameter of 51 cm. In any case, given that the only report of the 68-cm diameter vertebra comes from an email from a curator linked to a traveling educational exhibit, and given the odd wording, I am inclined to discount it. It’s almost impossible to rule out a typo, misunderstanding, or exaggeration (possibly well upstream of SO Chu Wing) as the source of the reported dimension. And so far, there is no other evidence to support it, and in fact what other evidence is available is inconsistent (as explained in my last comment). I’d love to be wrong about this, so if anyone has any more information, please let me know! Matt, maybe Junchang Lu (lead author of the Ruyangosaurus paper) would be able to confirm or deny this report? If you need an email address for him drop me a line and I’ll pass it on. Yep, good suggestion. I’ll email you shortly. Thanks for your enquiry again. Total length of 14 sections of dorsal vertebrae is about 4 metres. The total width of each vertebra ranges from about 0.8 metre to 1 metre. The total height of each vertebra ranges from about 0.8 metre to 1.1 metre. The centrum width of the largest vertebra (near posterior part of body) is about 68 cm. Hopefully they are useful for you. But about dorsals- 14 when any titanosaur not have more than 12? (I’m not shure) and second on the foto last vertebra is sacral no drosal maybe this vertebra have 68 cm centrum diameter. First, good catch on Dreadnoughtus – I had missed that completely. According to Lacovara et al. (2014) Supplementary Table 1, ?D4 has a cotyle 44cm tall and 46cm wide, ?D5 has a condyle 47cm tall, ?D7 has a cotyle 43cm wide, and ?D8 has a cotyle 47cm wide. Some of those might be exaggerated a bit by distortion – the ?D8 cotyle is only 24cm tall – but the ?D4 cotyle is approximately circular so can’t be explained by squishing. I’ll update the post shortly. As for Ruyangosaurus, the claim of 14 dorsal vertebrae is an immediate red flag. That would be unprecedented for any neosauropod. And from the photo, it looks like there’s some “plastersaurus” going on in the middle of the series, like one fragmentary vertebra was built out into at least one and possibly two additional ones. That could be how they got 14 exhibited dorsals out of a probable 12. Anyway, the claimed count of 14 does not inspire my confidence that the person has much familiarity with sauropod anatomy – and so my confidence in the 68cm vertebra diameter is correspondingly decreased. Is that based on a new, complete femur, or a reconstruction, or an estimate? From what I know about the one David Attenborough was talking about (= the one just mounted at the AMNH), Notocolossus is different. Firstly, Notocolossus was found in Mendoza province and not Chubut where the ‘AMNH’ one was discovered. Secondly, the ‘AMNH’ titanosaur is known from much more material. 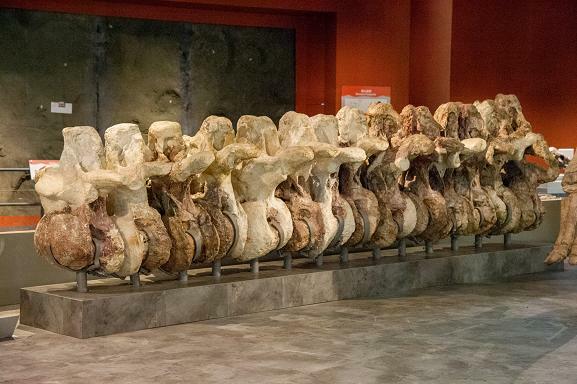 We don’t have the femur of Notocolossus, but we do have the femur of the ‘AMNH’ titanosaur. From what I’ve heard, a description is in the works. They seem to be taking their time, which is good. Thanks for the correction, Matt! When I mentioned the numbers 10-11, I was mistakenly remembering the number DORSALS for Futalognkosaurus instead of the cervicals. The paper reported it having 10-11 dorsals, and 14 cervicals. My mistake. What is the the height to the tallest point of the back for largest titanosaurs like this one, Argentinosaurus, Puertasaurus, etc? We should really ping Scott Hartman for his thoughts on that – and I’ll do that shortly – but from looking at mounts and skeletal recons of big (and tall) critters like Giraffatitan and Argentinosaurus, my guess is 6-7 meters. Anyone have anything more precise? And if so, how, given the uncertainties with reconstructing the incomplete big ones? Hi Liviu (and thanks for the ping, Matt). I just measured and I’m getting 7.15 meters right over the shoulders, which are usually the highest point on my reconstructions. Of course exactly how tall the back would have been depends on a series of interpretations about limb posture and pectoral girdle placement, but >7m seems like a good bet. Here’s a thing. An average giraffe is about 5 m tall, and the tallest ever measured was about 6 m tall. That means that these titanosaur individuals — and remember there is no reason to think they are especially big representatives — are significantly taller at the shoulder than the top of the head of the word-record giraffe. While we’re on the subject of how titanosaurs are better than giraffes, even the record largest giraffe individuals are still less than 1/50 the mass of your average lithostrotian. Heck, Basu, Falkingham, and Hutchinson (2016) volumetrically estimated Sivatherium giganteum ,both the largest ruminant and the largest giraffe in history, at just 800kg-1,200 kg. Diplodocus alone is around 10 times more massive than that, and Diplodocus is considered slender and fairly average-sized for a neosauropod. Speaking of intraspecific variability… how accurate a metric for ‘size comparisons’ do you think the centra (or, indeed, most bone) sizes really are? André the Giant and Peter Dinklage were / are both adult humans, but certainly have vastly different frames. I know it’s probably the best that we may be able to get, but I think it’s important to keep in mind. Speaking of intraspecific variability… how accurate a metric for ‘size comparisons’ do you think the centra (or, indeed, most bone) sizes really are? Short answer: probably horrible. I collect them mainly for trivia, and because I’m interested in superlatives. Long answer: centrum diameter is probably worse than most other single-bone measures, because of the complicating effect of pneumaticity. Let’s say a big, four-square quadruped of mass Y and athleticism Z needs a mid-dorsal centrum cross-sectional area of X. If that quadruped is Jobaria, which has apneumatic dorsal centra past about D3 or D4, the centrum may actually have a cross-sectional area of X. But if the dorsal centra are pneumatized, the same cross-sectional area of bone can be distributed more widely for a negligible increase in mass. If the air space proportion (ASP) is 0.5, meaning the vertebra is 50% air (e.g., Camarasaurus, X bone can be spread over an area of 2X. If the ASP is 75% (Giraffatitan), 4X, and if 87.5% (Sauroposeidon, “Angloposeidon”), 8X. That’s simplistically assuming that the cross-sectional area of bone tissue has to remain the same – it is more likely that the more pneumatic taxa could get away with less bone by deploying it more advantageously. 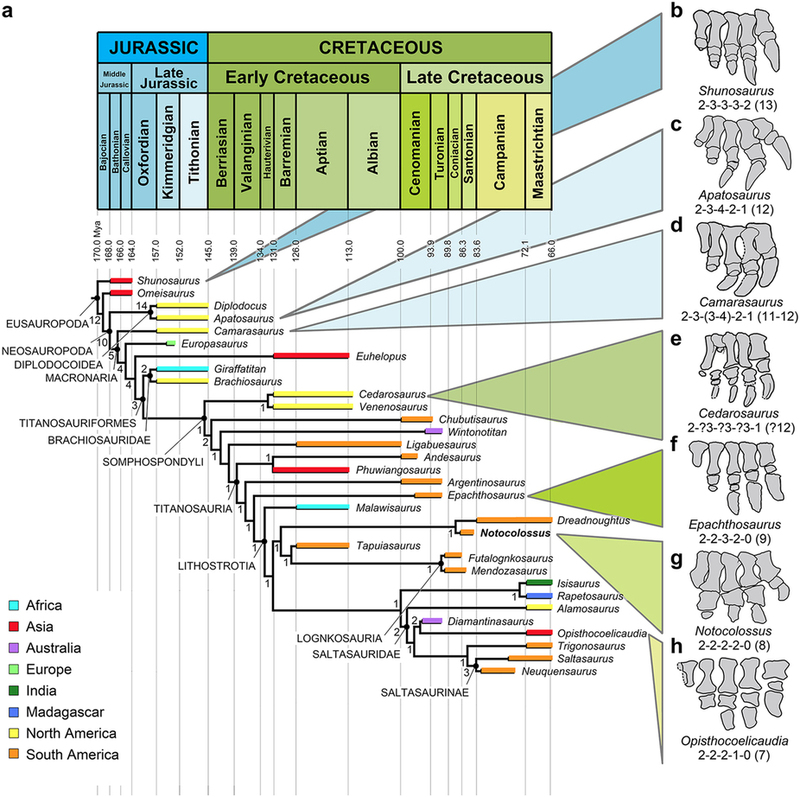 Still, it illustrates the problem of comparing centra across taxa of varying ASPs – which is pretty much all of them, among sauropods. It would be VERY interesting to make a big table of humerus and femur cross-sectional areas, mid-dorsal cross-sectional area “as-is”, and mid-dorsal cross-sectional area “corrected” for ASP, and see if there are any correlations. I’m the obvious person to do that, but I’m already snowed under with other things I’m even more interested in doing, so I’m releasing that idea into the wild. Anyone who is interested should feel free to run with it. We should maintain a page of projects that we’ve though of but don’t have time to do, inviting people to take one and run with it. We could track what’s happening with them all. Gunnar to the rescue! According to Lu, et. al. 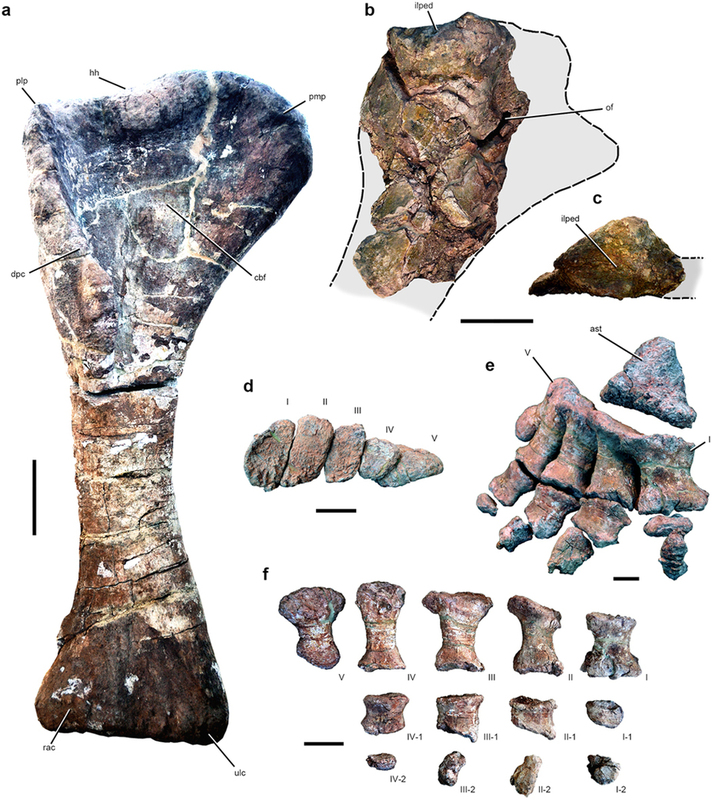 2014, the centrum width of the dorsosacral of Ruyangosaurus is 68cm. This is by far the widest centrum I’ve come across for any dinosaur. As for the dorsals, Lu, et. al. found 13 at the site (excluding the two holotypic dorsals), but most of these appear to actually overlap rather than belonging to a single complete sequence of vertebrae. The holotype femur as preserved is 120cm long, & was originally restored as 235cm. A second smaller, complete femur (167cm) was recovered from the site, but this femur looks far more euhelopodid than any sort of lognkosaur or other basal titanosaur femur, & it certainly doesn’t match the holotype femur very well (interestingly enough though, that of Patagotitan does, as do the posterior dorsals). José L. Carballido; Diego Pol; Alejandro Otero; Ignacio A. Cerda; Leonardo Salgado ; Alberto C. Garrido ; Jahandar Ramezani ; Néstor R. Cúneo ; Javier M. Krause (2017). 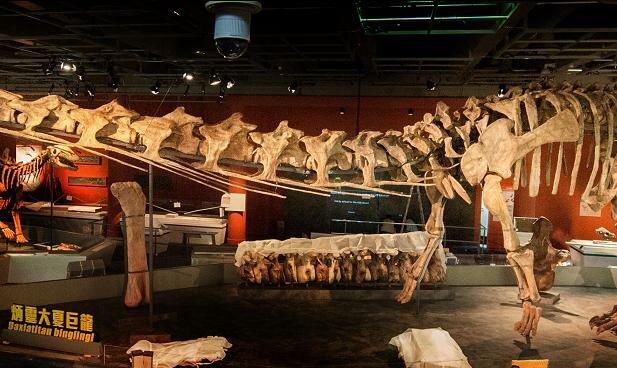 “A new giant titanosaur sheds light on body mass evolution among sauropod dinosaurs”. Proceedings of the Royal Society B: Biological Sciences. 284 (1860): 20171219. doi:10.1098/rspb.2017.1219. Lü, J.; Pu, H.; Xu, L.; Jia, S.; Zhang, J.; Shen, C. (2014). “Osteology of the giant sauropod dinosaur Ruyangosaurus giganteus Lü et al., 2009.” Geological Publishing House Beijing, 211 pp.